After keeping at it for a few weeks, I think I’ve finally found my groove with the library and the return to analogue books. 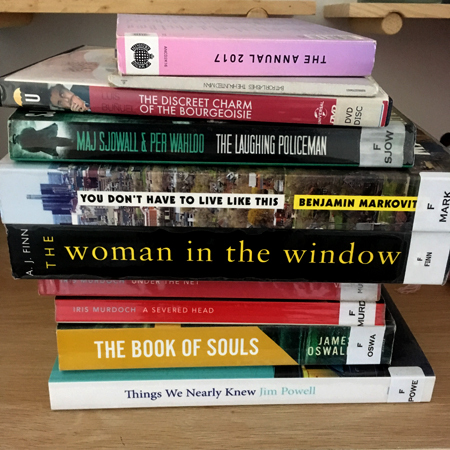 I seem to have picked up my reading pace and I’m taking a fairly ruthless approach – if a book isn’t doing it for me, I’ll abandon and move on to the next. One pretty obvious positive with the library is access to lots of books at zero cost. Kindle books are actually pretty cheap, but free is obviously a whole lot better! Of course not entirely free as I’m indirectly funding the library through tax and rates, but hey I’d be doing that anyway. It feels like I am accessing a diversity of reading material that I wasn’t from the amazon store. While there are undoubtedly many (many!) times the books on amazon compared with the local library, I’m invariably recommended the same type of pretty awful stuff (and have learned that any book with a variant of “gripping thriller full of twists” appended to the title is to be avoided). Random browsing on the site yields very little of interest either. I’m enjoying the novelty of aimlessly wandering around shelves for an hour or more randomly grabbing books. And because of the relatively small typeface size in analogue books, I’m needing to wear my reading glasses a lot more, which means that … well, I wear them. To supplement my proper glasses, I’ve bought a bunch of inexpensive reading glasses (of the same prescription) to store in strategic locations around ThePalace(OfLove) and a pair for my bag. This positive habit has meant that I’m wearing glasses in many other suitable situations – on the computer, on the phone &etc. And amazingly – *rolls eyes* – those headaches have magically disappeared. I did return very briefly to ebooks when my pre-order of Kristi Coulter: Nothing Good Can Come from This: Essays was delivered to the kindle. Adored it, love her writing and the subject matter is obviously pretty close to my heart! Recommended. Sadly, as much as I have found my way again with paper, there’s nothing quite like being able to press on a word and have the definition pop up. I had to break my flow several times with this book and take to my phone. Fortunately most of my reading is not so high-brow, but I’d quite like to get it there. Libraries are so important so I am going to ours on Saturday to broaden my reading! Oh excellent! Please do post your borrowings. It’s very definitely broadening! I’ve given up looking for particular books (which they never have) and just grab random things from the shelves.